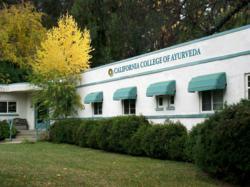 In a show of tremendous generosity and support for Ayurvedic education and the promotion of herbs as medicine, ORGANIC INDIA, an herbal company based in Lucknow (India) and Boulder, Colorado (USA), has committed to helping the college build the first teaching herb garden and outdoor classroom of its kind in the United States. The garden, to be known for at least the next 3 years as the “ORGANIC INDIA Herb Garden,” is the first of its kind in the United States. Designed as a mandala with a water feature at its center, the garden will consist of 8 large beds that will house between 50 and 100 species of medicinal plants. Ayurvedic students and students in the herbal apprenticeship programs at the college will care for the plants under the supervision of the director of the herb department, Brenda Igler who will work with the students to take the herbs from seed to medicine. Students in the program will grow and pick the herb and then learn to prepare a variety of medicines including herbal salves, oils and ghees. ORGANIC INDIA works with thousands of family farmers in India, cultivating tens of thousands of acres of certified organic farmland. The farmers are commissioned to grow organic crops, which ORGANIC INDIA purchases at a premium market price. The company supports their farmers by providing training, health care and education that enable them to be self-sufficient and to develop organic farming skills that will be passed on to future generations.